The Selkie’s Daughter is a Christmas adventure story for children and their parents (and their parents‘ parents) that explores many parallels to the experience of human life through the eyes of a curious selkie. A selkie is mythical creature inhabiting the sea as a seal, and then changing to human form on land. Selkies are similar to mermaids and swan maidens. While in water, the allure of human interaction is intoxicating for selkies. And while on land, they yearn for their freedom under the sea. Through this magical dramatic tale about growing up, the listener will discover if “the grass is greener on the other side” for our selkie heroine. Will the forbidden thrill of adventure be worth the exchange of consequences? Will her journey cure her aching loneliness? Will she find her true home? 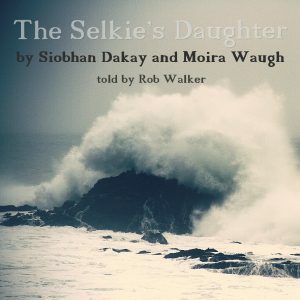 The Selkie’s Daughter – Print out Book for free. A couple of years ago Moira Waugh composed a melody for a backtrack Dan-T has produced. Moira shared the accapella on ccMixter and so the story began. The lyrics from Moira were so inspiring that a year after I finished the first version of the mix I started to write a story around the lyrics. Unfortunately my the range of my vocabulary is not too good. So I asked Rob Walker (who is publishing his poems on ccMixter as well) if he is willing to enhance the story and would be willing to do the narration. And the result of what he came back with is now available for your listening pleasure.